Ostensibly, the purpose of a PhD is to advance human knowledge. You get that degree for figuring out something new, and proving it to the satisfaction of people who know what they’re talking about. At the end of the day, humankind gets a little smarter, and you get to call yourself a doctor of philosophy. Looked at that way, there’s not a whole lot of room for PhD studies in the law. The law is a manmade thing, not something out there to be discovered, and an unholy number of people make it their business to know all of its various ins and outs. In other words, there’s not much “new” to the law to figure out. The exception is for research into how the law is applied, and philosophical attempts to identify the underlying policies that explain why the law is the way it is. This is what legal scholars already do. They don’t need a PhD to do it. Lowly JD candidates do it when they write notes for their law reviews. Scholars do it when they write books and law review articles. Bloggers do it when they’re not bitching about the job market or SEO. Even amateur cartoons have been known to take a stab at it. There’s just not a lot for a PhD to work with here, and it’s already being done elsewhere. Of course, that’s looking at it the wrong way. In the real world — particularly outside the hard sciences and mathematics — the PhD is just a prerequisite for a career in academia. If you want to be a professor, you’d better get that doctorate. It’s not about advancing human knowledge; it’s about training to be a “scholar,” however your academic field defines it. Looked at that way, Yale’s decision makes slightly more sense. The Law PhD would just be one more way of proving your bona fides as a scholar, another way to compete for a job as a tenured law professor. There are far more people who’d like to be a law professor than there are available positions, so the competition is insane. The usual “publish or perish” rules apply here as much, if not more so, than anywhere else in academia, so getting enough articles into some law review or other is one requirement (which explains the proliferation of law reviews that few bother to read — the demand is not for the finished product but for the publication service). But that’s just a starting point. To further weed out candidates, law schools require advanced academic degrees. The J.D. is an entry-level vocational degree, nothing more. They want people with an LL.M in the area of law they teach. More and more, they want people with a PhD in (as the Yale announcement says) “economics, history, philosophy, or political science.” These are what the law is about, after all (and what you should be studying in undergrad — not pre-law — if you want to be best prepared for law school). But a Law PhD is probably not being offered just as another way to prove one’s sholarly ability. The real reason is probably just supply and demand — and not demand from tenure candidates. The demand is from law school administrators, who want more and more ways to weed out those candidates. Because there are more and more people trying to break into law school academia. There are tons of people with LL.Ms and PhDs from other disciplines. But who has a PhD in law? Nobody. If it existed, it would be a great way to tell which candidates have learned how to be academics, which ones are already “one of us.” Yale is providing schools with a way to be more demanding of professorial candidates, and thus make the school’s job easier (while giving them something more to brag about.) Just as readers aren’t who law reviews are for, the PhD candidates aren’t really who this program is for. They’re not the customer, they’re part of the product. So let’s make the ivory tower a little higher. Of course, that will only exclude more people who have actually practiced law. But that’s what adjuncts are for. Okay, see that XKCD cartoon up there? That’s not how law-school academia works. It’s not exactly news that law review articles don’t carry the same weight in their relevant field as, say, scientific papers published in a peer-reviewed journal. Ask any practicing lawyer how many law reviews he subscribes to, and the answer is likely to be “zero.” Ask any practicing lawyer how often he cites law review articles in his motions or briefs, and you are likely to hear either “seldom” or “never.” Ask any practicing lawyer the effect that law review articles have on the practice of law and the advancement of jurisprudence, and he is likely to laugh condescendingly. It’s not exactly news, but it’s something people have been talking about this summer, after Chief Justice Roberts disparaged the usefulness of legal scholarship at this year’s Fourth Circuit Judicial Conference. Pick up a copy of any law review that you see, and the first article is likely to be, you know, the influence of Immanuel Kant on evidentiary approaches in 18th Century Bulgaria, or something, which I’m sure was of great interest to the academic that wrote it, but isn’t of much help to the bar. Law professors, of course, rushed to defend the relevance of their articles. But pointing out that occasionally a law review article might actually get cited in a footnote, to support an argument that was already being made, isn’t quite the strongest defense of relevance. And it’s foolish for legal academics to make such a defense. Nobody expects them to believe their articles are relevant to actual legal practice any more than one would expect a postmodernist paper in an academic literature journal to be relevant to the publishing industry. 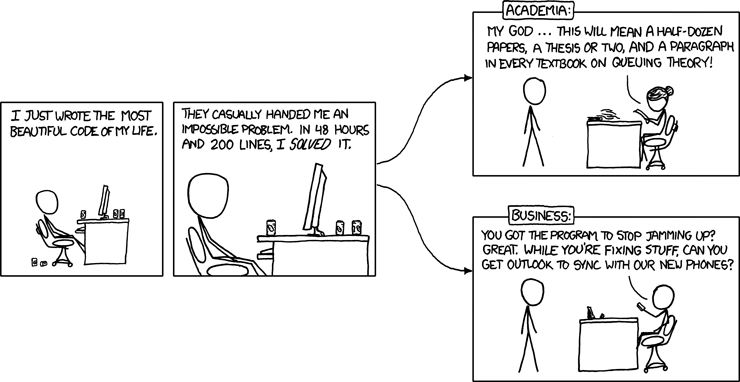 Academia and the real life it studies are rarely the same thing. And it’s foolish for legal academics to even imply that their writings ought to be useful to practicing lawyers. There are only two kinds of law review articles that are of any use whatsoever to lawyers and judges: One is the summary or survey of an area of law as it actually is right now this very moment. The American Criminal Law Review‘s annual survey on white-collar crime is a good example, and there are a fair number of brief summaries of more discrete areas of law as well. The most useful of these are the ones that deal with areas of law that are in flux, describing recent changes, which can help the practitioner or judge test the wind to see which way things are trending. The second kind of useful law review article is the kind that doesn’t so much restate the law as explain why it is the way it is. These are more rare, but can be very valuable for those trying to make a policy-based argument. A well-done article of this kind takes all the disparate decisions out there and tries to provide an underlying policy that explains most of them. Such a thesis is useful when dealing with an area of the law that is changing, or that one is arguing ought to change. These useful articles are not useful as something one would cite as part of one’s primary argument. If cited at all, it would be in a footnote. Their value is not as an authority to be cited, but as a guide to help focus or expand one’s own thoughts. But such articles are few and far between. The overwhelming bulk of law review publications are of little to no use to anyone besides the author. This is because law review publication does not serve the same purpose as other kinds of academic publication. Law reviews serve two purposes: One is to provide an outlet for career academics to publish something — anything — in order to achieve tenure. It’s a pointless exercise, as the quality of one’s articles is of no importance; it is the fact of publication that is important. Having been published often, and recently, is all that is needed to put a check mark in the right box. The fact of publication is itself no guarantee of the quality of scholarship, that’s for sure. That’s because of purpose number two: To give better law students a way to further distinguish themselves. We do that by having law students pretty much run the show. Students select which articles are published. Students do the fact-checking, making sure the cited sources actually say what the author claims. Students check the grammar, spelling and bluebooking. It’s a lot of work, and shows that one has the ability to juggle responsibilities beyond one’s caseload, and shows an aptitude for the kind of work often assigned to young associates, so it’s fairly prestigious and rightly so. But it is not peer review, and it is no guarantee that the articles themselves are any good. Grammar and cite-checking are not the same as substance. Neither of these purposes is to provide a useful product for practicing lawyers and judges. So because it is not their purpose, it doesn’t really make sense to knock them when they fail to do it. Still, wouldn’t it be nice? You know, if legal scholars were given tenure based on actually contributing something to our jurisprudence? If it was the rule, rather than the exception, for law-review articles to be useful summaries of the law or explanations of the unnoticed policies that explain why the law is and where it is likely to go? Then perhaps one might see them being cited a little more often. Being read by someone not involved in the publication process. Making a difference. Don’t you want to make a difference?